"Pirates of the Caribbean: On Stranger Tides" now playing! On New England's largest screen, you'll be captivated by larger-than-life swordfights, zany action sequences, and adrenaline-fueled pursuits. Adventure and over-the-top antics dominate Disney's Pirates of the Caribbean: On Stranger Tides An IMAX 3D Experience, now digitally re-mastered in IMAX 3D. Travel along with flamboyant seafarer Jack Sparrow (Johnny Depp) as enigmatic siren Angelica (Penélope Cruz) lures him onto Queen Anne's Revenge, the ship of legendary pirate Blackbeard. Forced to seek the fabled Fountain of Youth, Sparrow embarks on his wildest journey to date. He must use all his wiles to deal with the barbarous Blackbeard and his crew of zombies, Angelica, the ravishing pirate with whom he shares a dubious past, and the beautiful, enchanting mermaids whose masterful cunning leads even the most accomplished sailors to their doom. 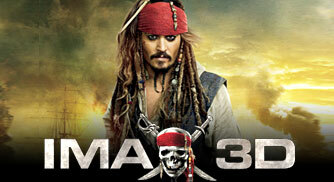 Now just imagine Jack Sparrow in 3D! Make your way over to the Aquarium’s Simons IMAX Theatre to start your adventure on the high seas. Note: Member passes are not accepted at this special presentation.